So Kamal is working in this field for short span of time. They started their work in this field of fashion designing along with collaboration of Elan in year 2012. Afterwards, So Kamal keep on making quality dresses for women on diverse occasions, festivals and events. In past year 2013 & 2014 So Kamal does collaboration with some fashion designers and brands which includes Zara Shahjahan. In start of this year, So Kamal with collaboration of well-known Ayesha Farooq Hashwani (an outstanding fashion designer) prepared different collection of this spring and summer season 2015. 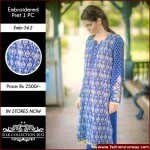 So Kamal recently launched their novel silk embroidered prêt wear collection especially for this forthcoming Eid. So Kamal collection is accessible on their all leading stores or outlets in different areas inside Pakistan like Islamabad, Rawalpindi, Faisalabad, Sialkot, Karachi, Lahore and so on. Their all attires are made with the help of famous and old textile industry of Pakistan named as “Kamal limited”. This textile has a good name not inside Pakistan but in other countries too. 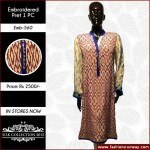 So Kamal Eid ul Adha Silk Collection 2015 is decorated with innovative & unique designs, embroidery, patterns and colors which ladies desire to wear. 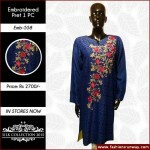 These all shirts are obtainable in format of individual piece which are in demand by ladies of every age. Ladies can find a diversity of bright and light colors such as blue, purple, cream, red, black, grey and so on. 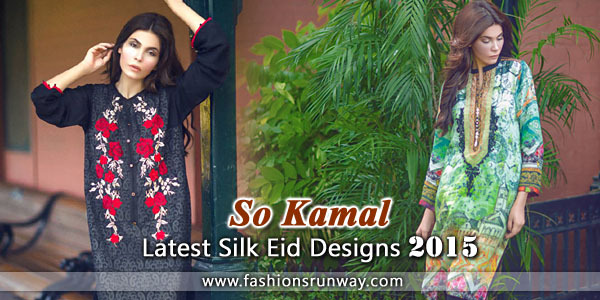 The material used by So Kamal in their new and latest eid dresses is silk which is preferred by majority of ladies in evening or night functions. As it is easy to carry and will enhance your personality and gives you a smart look. 7 bright colors of shirts of medium colors are available in their stores and outlets having different embellished work on it. 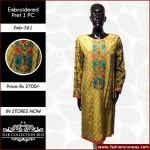 Prices of these ready to wear silk embroidered prêt collection are among 2500 to 3000 PKR. 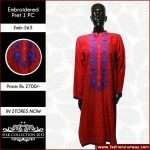 Check below here complete online catalogue of latest designs.